Pars chairman John Yorkston says he is uncertain over whether he would give his vote for any club's member share to be bought. Dunfermline Athletic chairman John Yorkston says he is uncomfortable over the prospect of any ‘newco’ being given a free pass into the Scottish Premier League. Rangers are currently in administration and have been docked 10 points by the SPL. 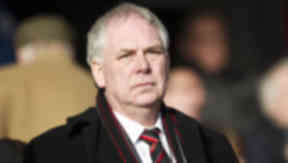 Player redundancies are expected on Monday, with £1m a month needing to be cut from the club’s overheads. Administrators Duff and Phelps raised the possibility over the weekend of the current club being liquidated, meaning a new club could be formed to inherit Rangers’ assets. SPL rules allow for the member share of a liquidated club to be transferred to another company, providing 90% of clubs agree on possible sanctions and the league’s board then approve the sale. Yorkston would be one of the persons voting on any side inheriting Rangers’ member share and he says he is unsure if his club would give their approval in such occurrence. “We have problems with that,” said Yorkston when asked for his thoughts on the prospect of a newco being allowed into the SPL. “We have a different view if they go into administration and come out of that. But if they go into liquidation, would we vote for them? “We would have to see what's behind it all. It's an awkward one. “There are always scenarios each way. But we have to look at all the facts first before we make a hard and fast rule. Yorkston, speaking prior to his attendance at an SPL general meeting over a change on rules to financial fair play, says a Rangers which survives should not be hit with any further sanctions. If the current company were to cease to exist, the Pars chairman says it could be the case that the new club’s route into the top flight would be blocked, leaving them to apply to join the Scottish Football League. “I no way am I condoning what's happened at Rangers with Craig Whyte,” he said. “On the other hand, any normal company coming out of administration comes out with a clean slate. “If they come out of administration, that's what happens. Liquidation is a completely different situation and they may well have to go down to the Third Division. “We would have to look at it and see what all the facts are. “The SPL has got to accept a new application. That would depend if the members were inclined to accept it or not.